Today there was a hot topic post on Civil Beat by Margaret Wille on her support of Bill 113. All the A’oles on there were commenting away about being poisoned and how everyone who speaks out for ag a paid industry shill and so on. 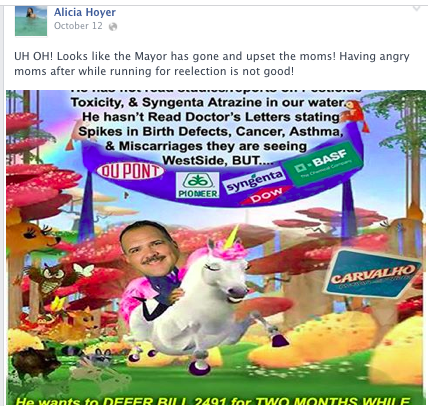 And of the course the usual anti-GMO stuff from the Babes Against Biotech as well. Then out came the loads of loud criticism from the BABS and Walter Ritte, etc. about CTAHR. Amazing to think that Ritte appears to blast, or at least not support CTAHR but has no problem with the same college funding his Molokai fishpond restoration project. Didn’t they do a good thing Mr. Ritte? Along with all the work done with the EPA that by the way all of your A’oles are critical of and distrust. Someone seems to be forgetting about how they were helped along the way by the very people they criticize. 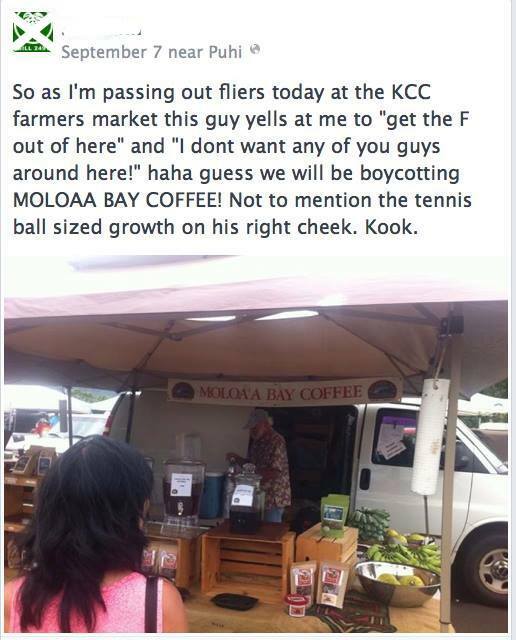 This entry was posted in No Aloha Commentary, No Aloha to Farmers and tagged biotechnology, Civil Beat, Dean Gallo, Genetically modified organism, GMO, GMO FREE Hawaii, GMO Free Kauai, Hawaii, Molokai, United States Environmental Protection Agency, Walter Ritte on December 12, 2013 by hawaiifarmersdaughter. In 2007, a study was conducted on the scientific literacy of the US public. The results found that only 28% of people were considered scientifically literate. 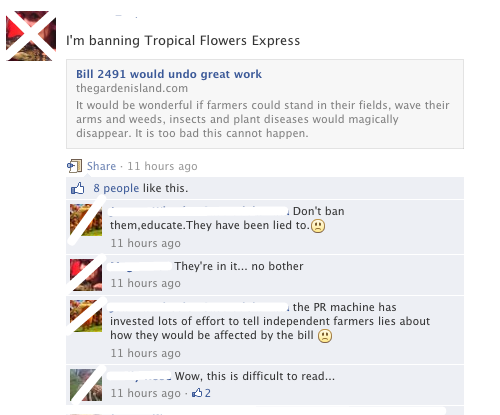 It is no wonder that we are having controversy in our state on issues related to GMOs. The minority of folks who understand and accept the evidence is the underwhelming minority and even less so when it comes time for speaking out. If you just take a look at the many recent polls on GMOs in the local papers, you can clearly see that reflected in the results. There are more people lacking the ability to decipher what is evidence and what isn’t. Then that same population makes for hot pickings for a very powerful fear mongering campaign by industries trying to grow its market share. There is an even slimmer chance that the leaders in office are sufficiently scientifically literate enough to make sound decisions, knowing the above stated statistics. It is no wonder we are seeing laws being passed in Hawaii against this technology. 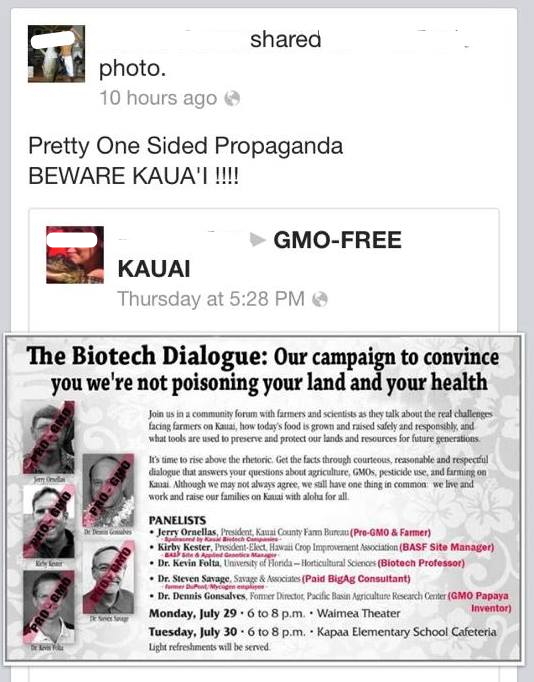 We also can’t forget Kevin Folta’s interaction with another Kauai activist, Christi Demuth. 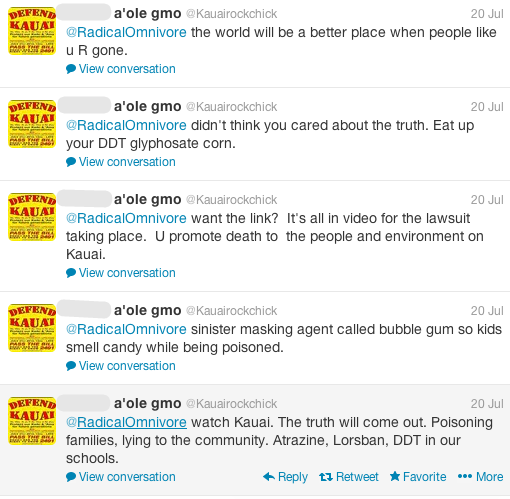 Or even the death threats that followed Kevin and Karl after their trip to Kauai. They are even paying people to sign this petition! Take a look at the commentary of these people. Note how they claim to be victims but then post vile comments like those above, being the same hateful people signing this petition, and who posted a litany of hate on the Pro GMO FB page when it first came out! These folks are the same extremists that leaders are working with and listening to in order to make laws. It’s no wonder why the community remains divided. In normal political dealings, radicals that can’t be reasoned are marginalized and the reasonable folks are the ones you mostly work with. That is the leader’s choice to either continue the division by working with loud-voiced radicals or choosing to support what is best for the people as whole and work with more reasonable and cooperative folks. Unfortunately, with tactics such as those witnessed, what leader wants to be subjected to this? You’d Better Vote That Way Or Else I Go See You Later In Da Back Alley! 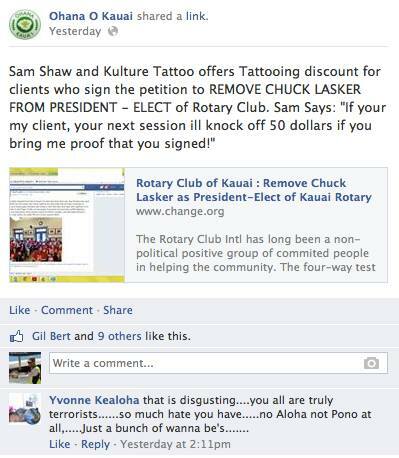 This entry was posted in The No Aloha Club and tagged Bill 2491, Change.org, Civil Beat, Critical thinking, Gary Hooser, Genetically modified organism, GMO Free Kauai, Hawaii, intimidation, Kauai, Literacy, logic, scientific literacy, skepticism, Social media, Tim Bynum, United States on October 22, 2013 by hawaiifarmersdaughter.